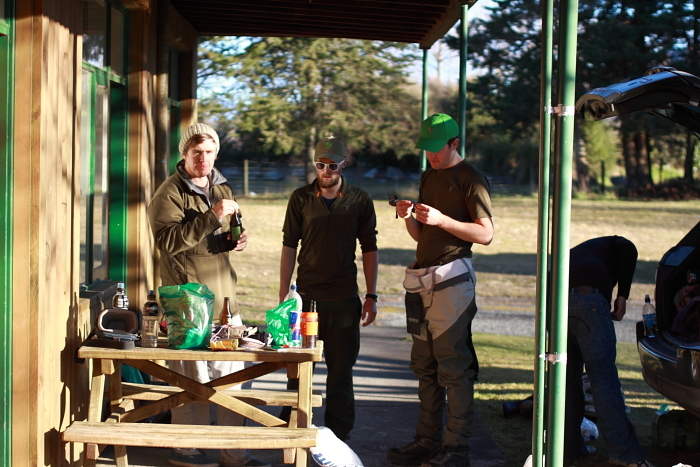 The Entire Gang – Good times in the Central North Island! I’m writing this one on behalf of the whole crew. 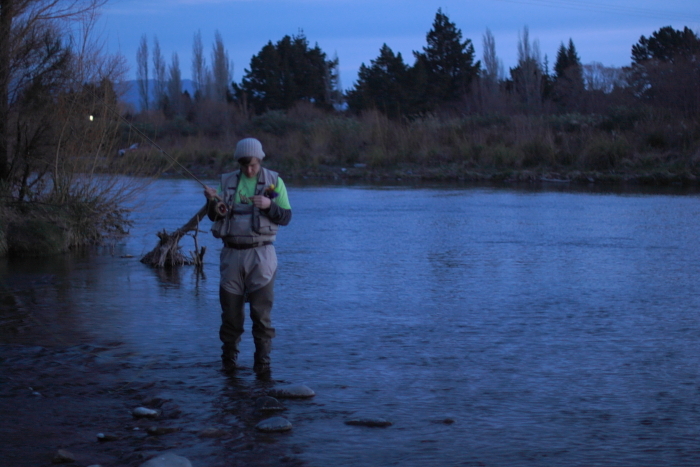 We’ve just come back from a weekend in Turangi… the fishing was tough, but we had a great time. I flew to Wellington last Wednesday afternoon and Jack picked me up from the airport. 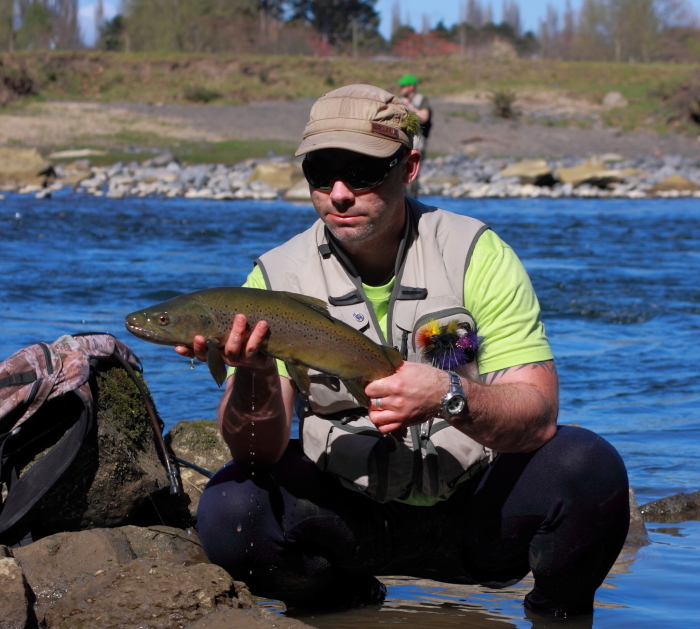 I’d never fished the North Island before, I was looking forward to finding out what it was like. 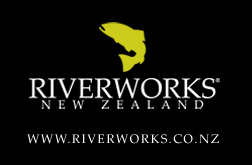 It was straight from the airport to Riverworks HQ to catch up with the guys, then we headed back into Wellington to stock up on a few bits and pieces for the trip. That evening Jack took me to Burger Fuel for a feed followed by gelato and beer from a cool little bar that I can’t remember the name of. I’ll definitely go back to all of these places the next time I’m in the neighbourhood – It was all good stuff. Thursday morning the alarm went off at 5:30. Not ideal, but we had places to be. We had arranged to take a detour through Dannevirke on the way to Turangi and catch up with the famous Dundee family for a couple of hours. Incredibly, we managed to find the Dundees without getting lost. How we did that I’m still not quite sure.. The Dundees are great people. Their Family consists of Grant, Michelle, and their two sons Daniel and Sean. They have a farm up that way and spend a fair bit of time fishing the local river, with reasonable success. Getting set up with the Dundees. 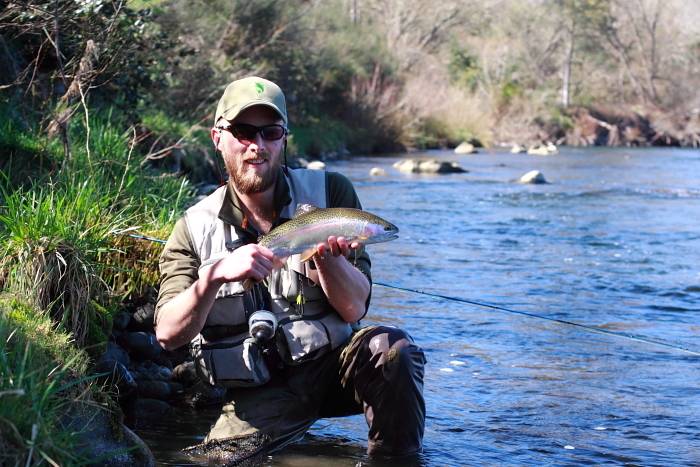 It was pretty windy that day which made casting tough, and the river had a touch of colour in it. 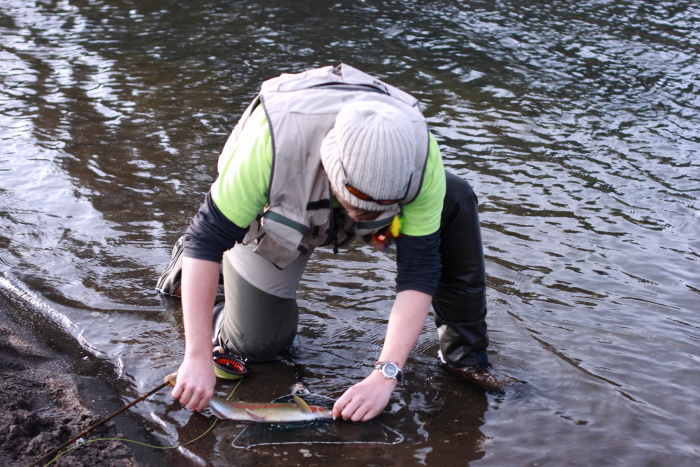 However Jack hooked and landed a wee rainbow pretty quickly on a small nymph. 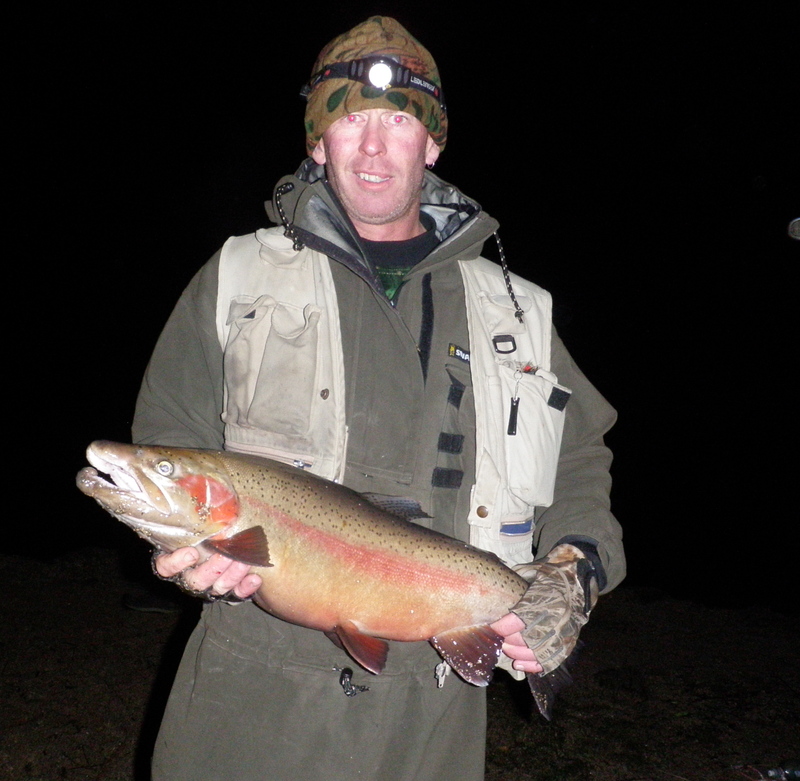 Dan Dundee is just learning to fly fish after cutting his teeth with the spinning rod. 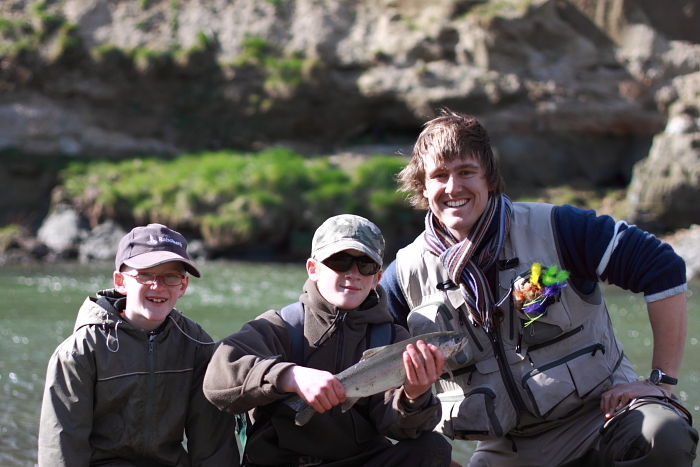 He is as keen as all young guys are when they are learning to fly fish and it’s great to see. We were all doing our thing when Dan let out an excited yell. 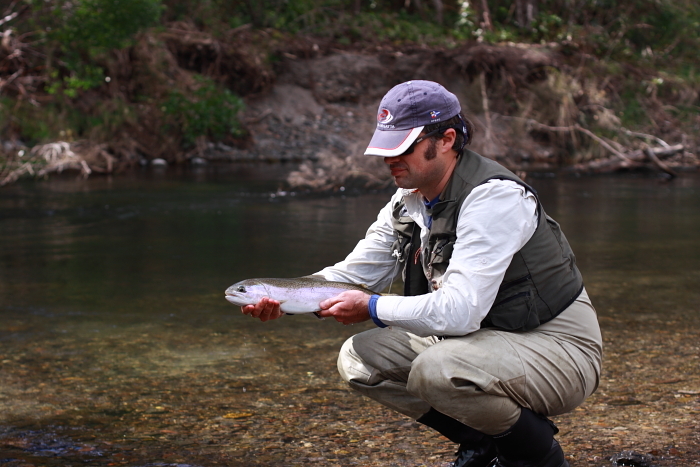 I looked across to see him with a bent rod and a nice rainbow leaping out of the water attached to his line. We all made for his direction and he pretty quickly had the fish on land. His first ever on the fly rod. 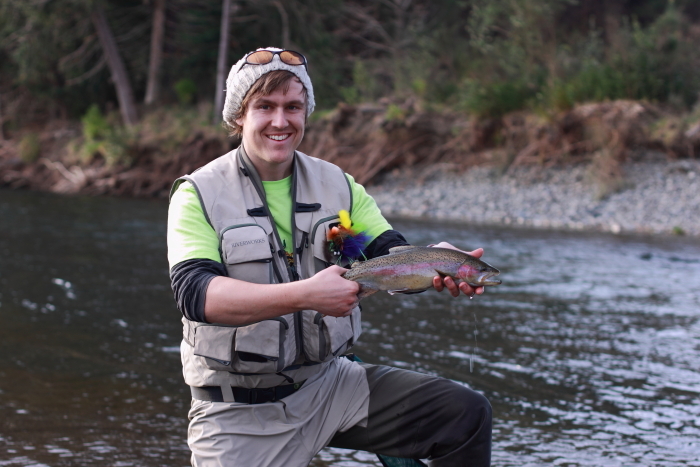 Dan Dundee lands his first fish on the fly! 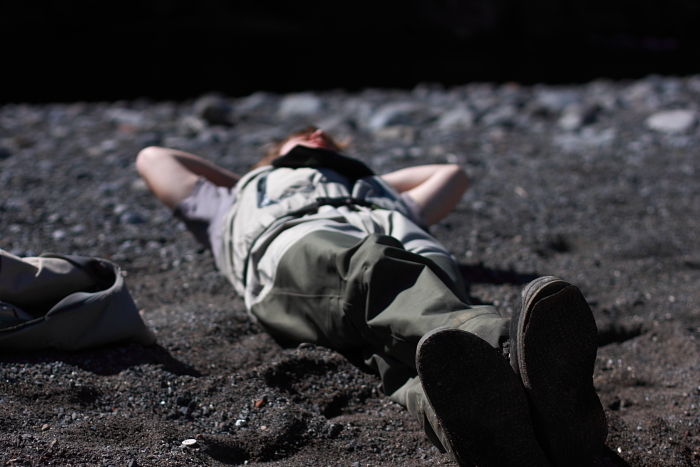 That was all the fishing action for the day. The wind came up stronger and we had to push on through to Turangi. It was a pleasure to meet these guys and spend some time with them on the river. 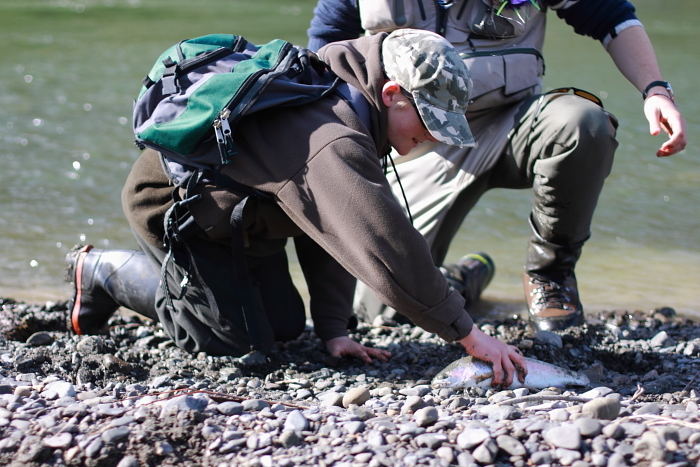 It was a priveledge that we were able to be there when dan caught his first one on the fly.He’ll never forget that moment and neither will we. Good stuff Dan! 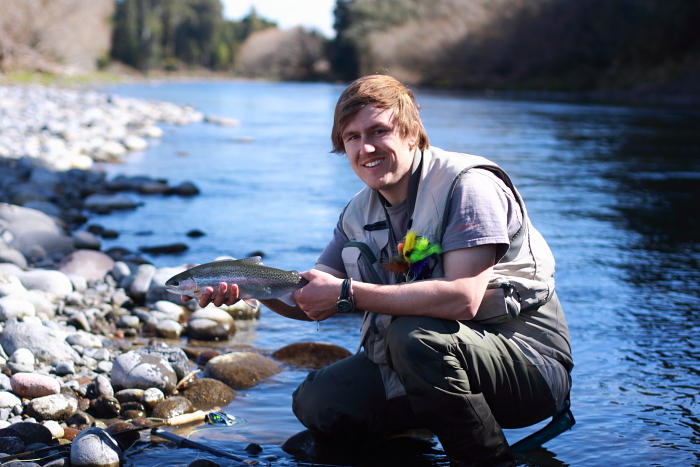 We made it through to Turangi and got some accomodation sorted out before ducking off for my first taste of fishing the Big T.
The reports were reasonably good, there were meant to be a few fish in the river. We made our way to the river and away we went. 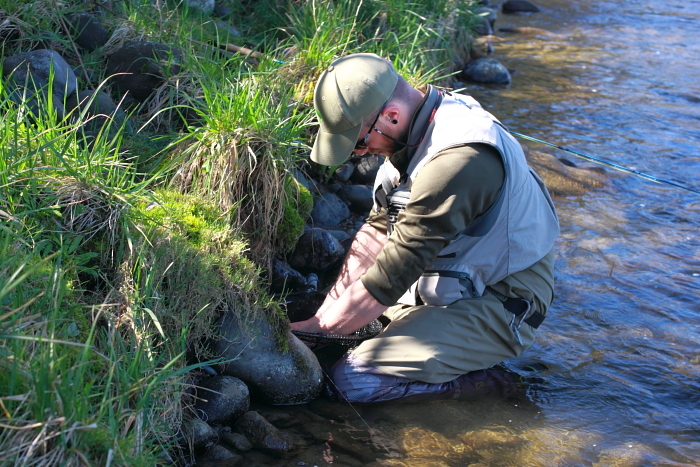 We walked downstream past several other anglers to a section of water which didn’t have anyone else fishing it. I rigged up a nymph with a great big indicator and a couple of split shot. It wasn’t too long and Jack hooked up. Jack caught one more and lost a few others. I only managed the one hook up, but dropped it pretty quickly. Still, it was good to feel a fish on the end of my line! 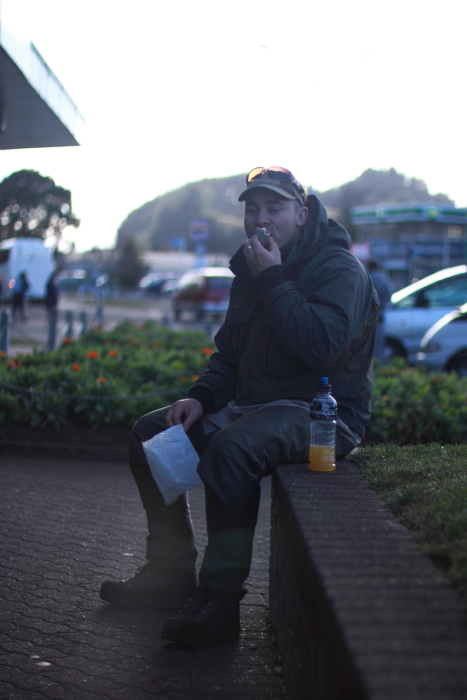 That night we met up with Tone from Taupo at the pub for a couple of beers. I had some streamers to give him to try out. Unfortunately I managed to set the hook from one of them right into my finger up to the bend… it wasn’t coming out easily either. It made a really sick crunching noise when I finally managed to pull it free. Let’s just say it wasn’t very nice and I don’t want to do it again! Fish and chips was the food of choice for the evening. It was more or less inhaled at the cabin and we were off to sleep soon afterwards. Breakfast the next morning wasn’t quite what the dietitians recommend. The next day was tough going. We fished the whole day for little reward. 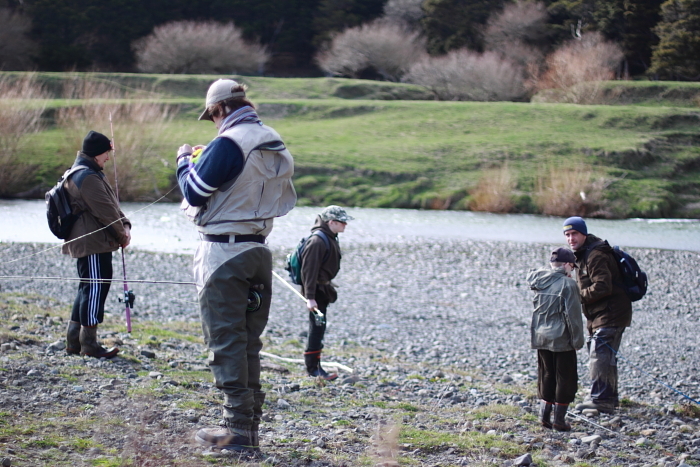 We fished four different rivers, I hooked and lost one, we watched another angler catch a fish from a stream, and Jack caught a small one on the Tongariro which he refused to let me photograph! 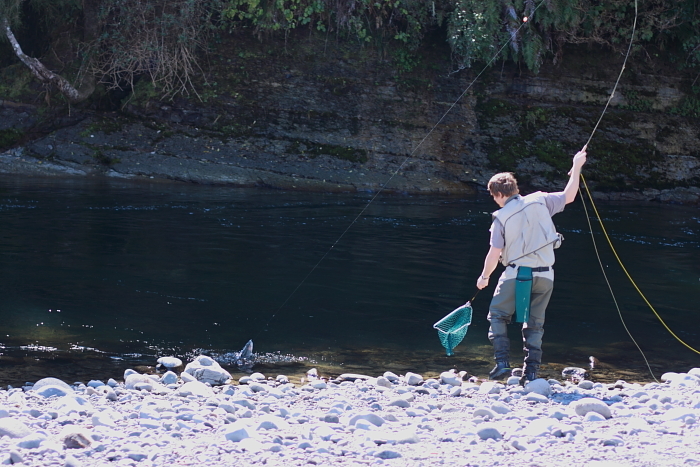 The general consensus from those we spoke with was that the fishing had gone cold again… There were a few disappointed people on the river that day. That afternoon some more troops arived in the form of Rob, Alex, and Andrew Marshall. Beer, Burger King, and more beer with some Taupo hot – rodders was the order of the night. The next morning we headed to a different river system for a look. It turned out to be a good option. Rob hooked up early on, he landed and released his fish and was on again pretty quickly after that. Unfortunately i don’t have a picture because I was on the other side of the river at the time.. The boys caught a few fish that day. Even I managed to break my North Island duck. I pulled a nice brownie from under a tree in a nice run. 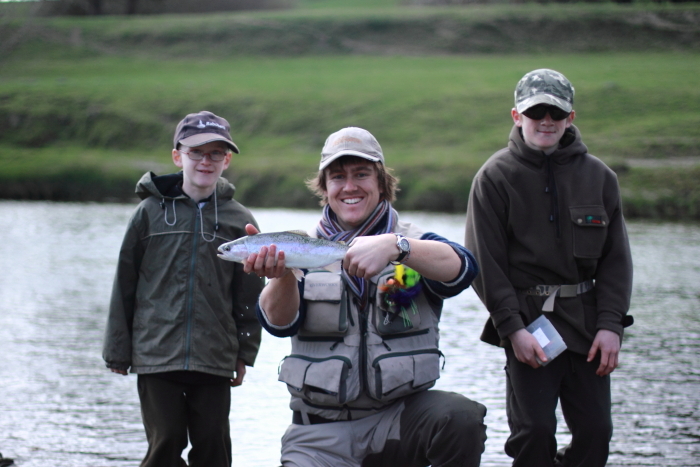 We fished right to the limit point for winter fishing and Jack pulled a fish from the final pool. We all sat on the side of the river at that top pool for about two hours… some talked, some slept, and some even went over for a cast from time to time. That afternoon when we got back we were joined by Lucas, the final member of our party. I went with Jack for a couple of hours to meet with some others who were in the area, before returning to the cabins to drink a few beers and have more than a few laughs. I’m glad I didn’t have to sleep in the room we were drinking beer in… it really stunk the next morning. Four guys who’ve all been eating junk food and drinking beer doesn’t make for a nice smelling room. It was disgusting! That morning we headed back to the same river from the day before, but lower down. Jack and Andrew Marshall – on point. 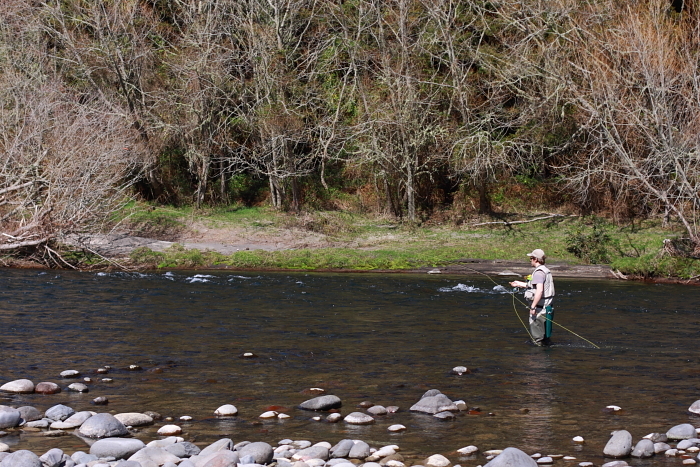 I crossed over and fished the same side as Alex, while the others were on the other side of the river. 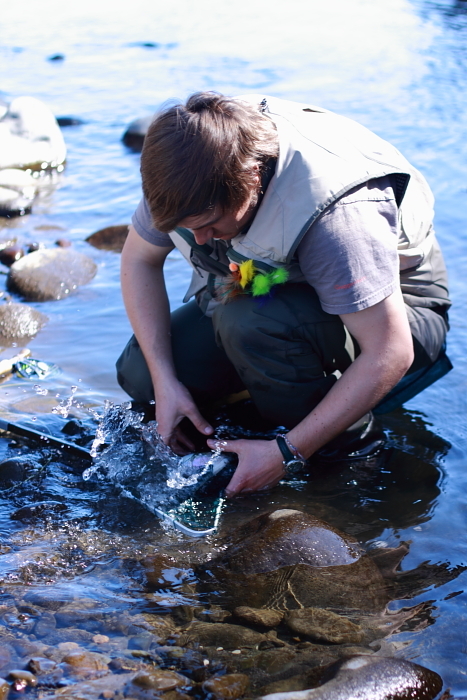 There were a few more fish caught that day… but I only managed to get pictures of fish Alex and I caught. I’m sure the others have more photos. This brownie was pulled from a pocket at the top of a big papa slab. That was all for the trip. All up it was a great time. Despite tough fishing at times, we pulled through and brought a few to land and had some fun. I can’t wait for the South Island edition this summer… I’m sure the others are looking forward to it just as much!